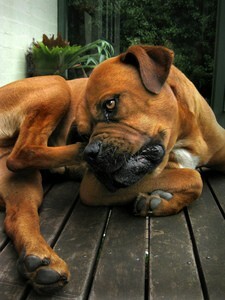 Have you ever watched your dog scratch his ears? If so, he may have dog allergies. Skin and allergy problems in dogs are not at all uncommon. The truth is dogs get allergies just like humans do. Unless you notice the symptoms, you may not realize that your dog truly has allergies. Dog allergy symptoms are different than the allergy symptoms people get. All dog breeds can get allergies. Usually (but not always), a dog will develop allergies after the age of 2. Once a dog gets allergies he will have them for the rest of his life. Just like with humans, the older your dog gets, the worse the allergies will get. Airborne allergies– caused by irritants found int he air seasonally like tree pollen, grass pollen, and weeds. Flea allergies – a single bite by one flea can break open the dog’s skin and cause irritation. Food allergies – vary widely from dog to dog; many dogs are allergic to beef, pork, chicken, turkey, eggs, soy, corn, or wheat products. Contact allergies – practically anything your dog comes in contact with could cause an allergic reaction. If you suspect your dog to be allergic to something, have your vet check it out. There are many different ways to treat allergies in dogs, ranging from not sending your dog outside when pollen is in the air to feeding your dog a natural diet. They key is finding out exactly what is triggering your dog’s allergic reaction first. From there, your vet can tell you which treatment will work best for your dog. More about dog allergy symptoms and treatment options. Dog Have Seasonal Allergies?… Benadryl To The Rescue!